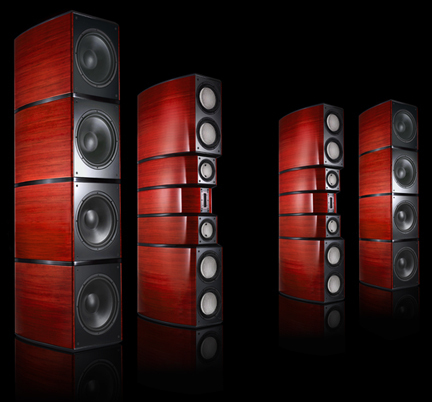 The Evolution Acoustics MMSeven is the ultimate full range loudspeaker. From the deepest notes of a pipe organ to the highest notes of a Harmon muted trumpet, no other loudspeaker, regardless of price, reproduces music quite like the Evolution Acoustics MMSeven. The Quest For Lifelike Sound – The journey of creating this magnificent transducer started with the unenviable job of listening to countless midrange drivers, tweeters and woofers. After the selection process was complete the next task was to design a crossover that would seamlessly integrate all of the chosen drivers to appear sonically as one. This is where the engineer is more like a fine chef than one might imagine. Once the values are decided, the voicing of the parts come into play. Capacitors, resistors, coils, internal wiring all have their own sonic signature. The trick is to get the flavor just right. Only the finest parts were selected, including reference grade film and foil capacitors, Goertz high purity copper foil inductors, Mills ultra high current 1% tolerance wire wound resistors, and Teflon insulated solid core copper wiring. All of these parts are hand matched and soldered point to point in our constant voltage crossover circuits without the use of thin PCB traces, which restricts current flow. The easiest way to understand how our crossover works is to imagine straight wire from the loudspeaker binding posts directly to the drivers themselves. It is the purest and cleanest possible signal path. You can really hear the difference! Rather than use inexpensive “hook-up” wire as is widely used in high-end audio, we took an “over the top” approach. The internal wiring that we use is identical to the wire used in our highly regarded speaker cables and interconnects. The amount of conductors used inside each loudspeaker is greater than most cable manufacturers use to produce their interconnects and speaker cables. The result is a much greater sense of ease , clarity and inner detail, or micro dynamics. Once the internal parts were selected and the crossover was designed, the next step was finalizing the cabinets to hold these parts. Creating an inert container for the internal parts was of the utmost importance. Also, we wanted the Evolution Acoustics loudspeakers to look as good as they sounded. These priorities led us to listening to different materials and ultimately choosing Baltic Birch wood. We chose not to build the conventional six sided box. The shape and size of the cabinet had to be dictated by the size and shapes of the drivers. Working under these guidelines, we heard a soundstage that amazed us. It was huge and realistic and the loudspeakers sonically disappeared. Each channel of the MMSeven contains over four thousand sections of computer routed Baltic Birch wood that are stacked and then laminated together with a six ton press. We did not want to use veneers, or skins, as most companies choose to do. The end grain of the wood was so beautiful the decision was made to finely sand the cabinets and finish them with a violin stain similar to fine musical instruments. The process is very tedious and entails many steps. It is truly an art form. Internally the cabinets are quite special as well. Most loudspeaker manufacturers use wool or some man made material to attempt to dampen the internal chambers of their loudspeakers. At Evolution Acoustics we recognized that much more needed to be done. The idea was to create an anechoic chamber inside our cabinets that would greatly reduce or eliminate internal standing waves. This is done by creating random irregular shapes visible only from the inside of the loudspeaker. The thickness of each slice or section also plays a role in creating a more rigid and less resonant cabinet. The cabinet randomly varies in thickness from a minimum of three inches to a maximum of six inches. No expense was spared on the interior or exterior of the Evolution Acoustics loudspeakers. Finding a great loudspeaker is a goal we all have. Have you ever purchased a loudspeaker that sounded great at the dealer’s showroom and brought it home only to be disappointed. The main reason is the dealer had a room that the loudspeaker integrated well with. Evolution Acoustics engineers are well aware of this problem and have addressed it with the MM Series of loudspeakers. The MMSeven woofers and subwoofers are mounted in sealed cabinets. This allows much greater flexibility with regards to loudspeaker placement as well as sounding much more dynamic and much more alive. There are still other reasons why these problems exist. Rooms inherently have nodes. Understanding these issues, it is no wonder, it is such a challenge to get great, good, or even acceptable, bass in your listening room. Evolution Acoustics incorporates adjustability in the lower frequencies to help alleviate these challenges. The MMSeven allows you to tune the bass specifically for your room. Not only does the MMSeven reduce the effects the room may impart on your sound, but you also have the ability to adjust the loudspeaker for personal taste. Some people prefer a warmer more romantic sound, while others prefer a cooler or more clinical one. With a simple turn of a dial, you can select the type of sound you prefer. Also, as we get older we hear high frequencies differently than when we were younger. Evolution Acoustics incorporates adjustable tweeters to suit personal sensitivities and preferences. gray; without hue; of zero chroma; achromatic. Music is all about color. At Evolution Acoustics we feel our loudspeakers are not neutral as the above defines. Rather they are rich in color as are the notes that emanate from the actual instruments that create them. Our goal was to create a “natural” or “true” copy of the archetype. The Evolution Acoustics MMSeven offers musicality, clarity and dynamics unapproached by any other loudspeaker on the market today. Ultimately we believe that once you hear an Evolution Acoustics MMSeven you will realize that there is not a better built or better sounding loudspeaker on the planet!